For those unfamiliar with who I am, I am bangishotyou aka “the dude who’s all about ferrets” and I have some wonderful news to share regarding black-footed ferrets. Before I get to said news I’d like to cover a brief history of the species for those unfamiliar with it. The black-footed ferret (Mustela nigripes) aka “American polecat” aka “prairie dog hunter” is a species of mustelid native to central North America. The species was originally discovered in 1851 and over the course of the 20th century and largely due to a decline in the prairie dog population and Sylvatic plague was eventually declared extinct in 1979. That is until Lucille Hogg’s dog brought a dead one to her doorstep in Meeteetse, Wyoming on September 26th, 1981. 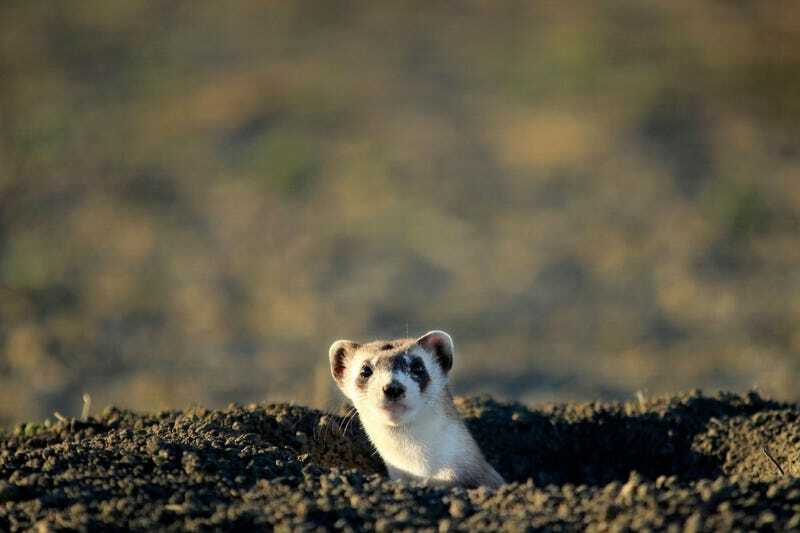 As a result of this Meeteetse became the birthplace of the black-footed ferret recovery and within a month a live individual was spotted in the wild causing conservationists and researchers to flock to the region to search for and study the last remaining wild population. At its peak the Meeteetse population reached 129 individuals by 1984. However, within a year fleas carrying the Sylvatic plague were found in the area. Over the course of 1986 and 1987 efforts are made to save what members of the population they can for a captive breeding program, of those rescued only 18 individuals (11 males and 7 females) survive. Within the year two litters are born which are the first to survive in captivity and the number of black-footed ferrets increases to 25 individuals. Throughout the next two decades additional kits are born across the country in a number of captive breeding programs at various zoos and biological institutes and as a result the species is slowly but surely reintroduced into the wild across eight states and even Mexico. Four self-sustaining populations can be found in South Dakota (two there), Arizona, and Wyoming. However, for some reason or another no captive born individuals were released back from whence they originally came in Meeteetse, Wyoming. That is until this past week. On September 28th, 2016 black-footed ferret were reintroduced to the area! For additional ferret related news and information be sure to check out any/all of the following links written by myself and mythbri. And for a much more thorough timeline of the Black-Footed Ferret Recovery, please, check out this link.